While Janelle is out of state during the first half of 2016, Ithaca Family Fun will not be accepting sponsors. 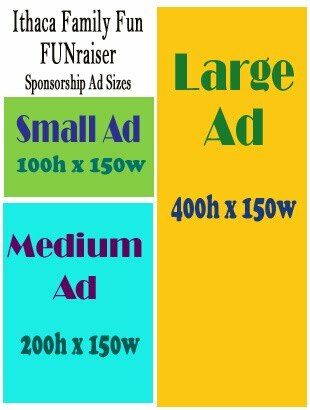 If you're interesting in sponsoring in the future, check out the info below. Thanks! Why support Ithaca Family Fun? poll, Ithaca Family Fun is THE online entertainment and recreation resource for families with young children in Tompkins County! Since I began tracking in January of 2011, Ithaca Family Fun has received over 72,000 hits and 205,000 page views. Daily, Ithaca Family Fun receives between 100 and 400 hits. In the month of August, 2014, we had 4,735 unique visitors and 10,173 page views. That’s 10,173 times Ithaca parents could have seen you supporting their favorite website! February FUNraiser “In the Key of Ithaca Piano Studio” received more hits to their website in February than they had since August, and more than they’d had in October, November and December combined. In one week, FUNraiser Polka Tot Children’s Consignment received 129 direct hits to the blog post about them, and 330 indirect “front page” views, and 654 views to Facebook posts mentioning their sale. Your business or organization will also be featured on the Ithaca Family Fun Facebook page in the monthly FUNraisers post. If you provide a special offer for Ithaca Family Fun Facebook fans, you will get a second Facebook feature to advertise your deal or give-away. Sponsors will also be mentioned in each "weekend roundup" email blast. Order of ads will change on each page. "Top spot" positioning is available for additional fee.